I think this is such a fun question. I love cooking, especially during the summer. Time spent in my kitchen is time when I can start—and finish—a project in one span of time. So many of my other projects take weeks and even months and even years to complete, so cooking gives me a nearly immediate sense of gratification. Plus, it can also be family time if one of my kids wants to help me cook or just sit at the counter stools to have a chat while I cook. Either way, it’s a nice relaxing time. Below are some of our favorite summer dinners. But before we get to that, here are a few quick thoughts on breakfast and lunch. One of my favorite summer dishes is pasta salad. It’s quick to make, just boil some noodles and while they cook chop your veggies, cheese and / or meat. I like to make a big batch of pasta salad and have it for dinner one night, and then eat the leftovers for lunch throughout the rest of the week. 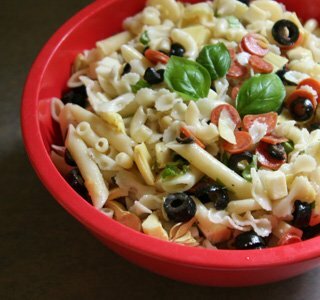 Pasta salad is also a great make-ahead food that’s easy to take on picnics or other summer outings. I was recently given a Panini maker by a client. What a wonderful gift this has been! 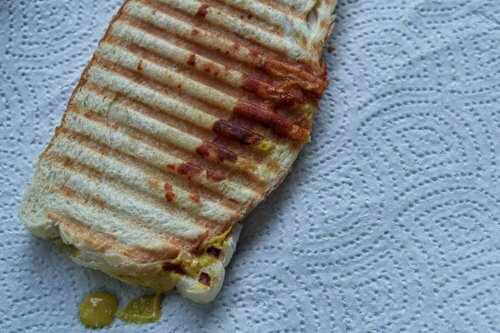 Make your own Panini night is a new favorite meal at the Garvey house this summer. It’s quick and simple, and since everyone gets to choose what is going on their personal sandwich, no one complains about dinner. Plus, dinner prep takes virtually no time—slice a few fresh veggies like tomatoes, onion, cucumbers, or whatever you have on hand; wash up some basil or other fresh herbs; and pull out cheeses, lunch meats, bread, and condiments, and you’re done. It’s fun to see how everyone starts with the same basic ingredients, but puts together their own unique creation. This week I made a great one with sauteed spinach, havarti cheese, tomatoes, basil and mozzarella. Yum! We serve our paninis with simple sides like coleslaw, chips, and fresh fruit. And when we’re feeling really fancy, we serve them on paper towels. Cold sandwiches are a terrific option for nights when you have summer outings. Use the same basic idea as above—simply pull things out of the fridge and let your family create their own sandwiches to go. 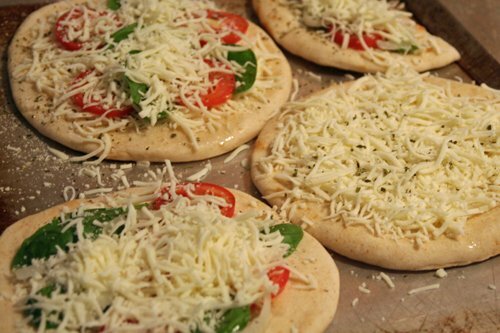 For the last few summers, one of my favorite dinners is pita pizzas. Again, we turn this into a do-it-yourself night, which means, a bit more family fun time in the kitchen, less work for mom, and happy kids who get to top their pizza with whatever sounds good to them. Some of our favorite toppings include olives, artichoke hearts, fresh parmesan cheese, fresh mozzarella, basil, oregano, onion, green peppers, mushrooms or pesto. Salad for dinner is another summertime favorite around here. Consider making your own salad bar by storing toppings like grape tomatoes (easy to wash, no cutting needed), walnuts, sunflower seeds, onions, cucumbers, artichoke hearts, olives, radishes, feta, mozzarella cheese, parmesan cheese, canned beans, canned corn, frozen peas, and pepperoni in plastic containers on a tray in your refrigerator. Wash up some lettuce and pull out the tray for a simple, do-it-yourself dinner. For sides on salad night, we like French bread or pitas with hummus. At least once a weekend we have smoothies for lunch. Our favorite is made with vanilla yogurt, strawberries, blueberries and bananas, with whipped cream on top. Cheese and crackers add just enough extra calories to hold us over until dinner. 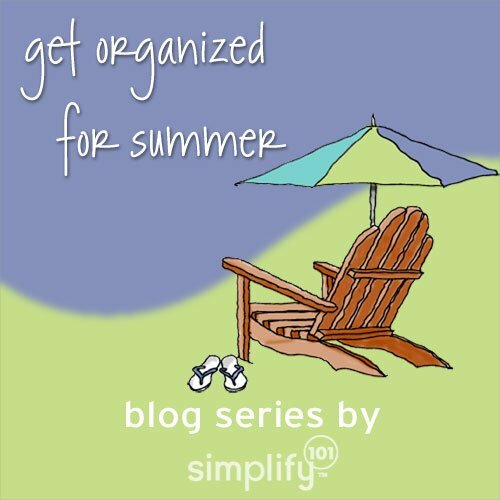 Before we stopped eating red meat, pork and chicken, our summer dinners revolved around the grill—burgers, hot dogs, chicken, and pork tenderloin with simple sides like salad, coleslaw, chips, or grilled veggies (onions, zucchini and oregano is a great combination, by the way.) Now, we’re always looking for new things to grill. Some of our new favorites include Boca burgers, salmon, shrimp kabobs, and of course veggies. I’m still looking for a good grilled portabella mushroom recipe, so if you know of any good ones, please feel free to share. Overall, our theme for summer eating is to keep it fresh, simple and light, with a focus on being together as a family. Many of these dishes can be pulled together in a snap—like the paninis, pizza, and salads—by cutting up fresh veggies and storing them in sealed containers in the fridge. We also always have on hand fruit, crackers, cheese, granola bars and nuts for quick and healthy snacks, at home or on the go. And, though this isn’t particularly quick, it really wouldn’t be summer without homemade ice cream. Thanks so much for your comment Emily! That couscous looks great! Hi! I follow your blog religiously, and have used many of your ideas…although my stuff never seems to come out as cute as yours does! Anyway, you mentioned that you are looking for a good grilled portabella recipe. We have one! It’s posted on our blog – and I’ve given you the link above. I’d love for you to try it and see what you think! Happy eating, and I, as always, look forward to your next post! Thanks so much for the recipe, Patti! I will give it a try. What a clever idea to use steak seasoning! Aby, I want to come eat three meals a day at your house! Everything looks and sounds delicious!! Grilled trout on the bbq is one of my go to fast meals, especially in the summer time. Trout is thinner and cheaper than salmon and is mild enough for everyone’s taste buds and I can have dinner on the table in about 15 to 20 minutes. I buy it with the skin on. Rinse and dress with a bit of olive oil, lemon zest and juice of half a lemon (serve the other half with dinner,) a bit of thyme, salt and pepper. Grill skin side down on an oiled grill until it is cooked about 3/4 the way through then gently turn over and grill for another minute or two. Thanks, Nancy! That trout sounds delicious! I LOVE portabello mushrooms on the grill. I love him with a bit of herbed goat cheese melted on them! YUM!